Anger management is a therapeutic programme for those excessively attached to anger. It’s possible to manage anger with some degree of success, but not as a permanent solution. The difficulty is that all therapeutic methods are a partial treatment of the universal symptom of unhappiness. Heal one aspect of the emotional self and another malady soon pops up to take its place. In my research into the practice of anger management I’ve not yet seen or read anything that really puts the spotlight on the truth of anger. This isn’t really surprising since the root cause disguises itself amongst innumerable other negative forces, each vying for top spot in the emotional hierarchy within the body. The overriding feeling in people attached to anger is to blame someone else for their seething discontent. This is often reinforced by sympathy from others. For many people anger is an emotion which occupies a special place of affection akin to an old friend who’s always around in times of need. Perhaps it’s the stylised image portrayed in films in the sixties of the ‘angry young man’ rebelling against society, making it ‘cool’ for successive generations to emulate. Mood is the passive state of anger. When left to ferment as unresolved hatred or resentment, anger engulfs the mind and manifests externally in people as a dark and sinister emanation. This brooding aspect of the personality becomes the focal point of many people’s identity. Mood is not dissimilar to mist that lingers over moorland, limiting visibility and making it dangerous to get around. The difference is that mood is a black noxious cloud that pollutes the psyche, which makes it difficult to be in the company of such a presence. 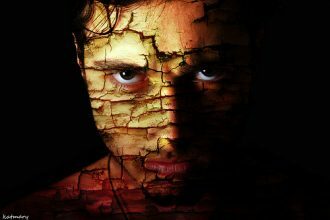 At every level, anger looks to externalise in the world as a reaction to events and circumstances which reflect to some degree the original trauma at birth. People often feel better after an angry exchange, but it’s not long before the pressure builds up again and the cycle is repeated with another wave of anger projected into the world. The result is intermittent outbursts, often released as a missile of hate and accusation towards those we profess to love. In extremes, anger rapidly escalates into domestic abuse in the personal life; and collectively, when united by a cause and stoked by the masses the inevitable result is war. What’s not common knowledge is that whenever anger arises it’s the same in every body and varies only in intensity. To be free of the possessive entity of anger involves confronting the most base and primal energies within the human psyche. Anger is a psychic force, pathologically attached to the sensual experience only self-conscious human beings can provide. No provision is made in nature for anger, which is why no other animal apart from the human species gets angry or emotional. Some animals can indeed be savage and ferocious, but only as an expression of their instinctual nature to survive and procreate. After a violent altercation they quickly reconnect with their wellbeing and retain the pure experience of life. If any animal could reflect on the memory as we do and continually dwell on the cause of the pain, they too would become vulnerable to the emotional possession of anger. The difficulty in mastering the effects of anger is the speed in which it’s suddenly there. The force of anger simmers just below the surface awareness and only needs the slightest provocation as a trigger to enter existence through the brain. Before you know it, the familiar feelings tighten as emotional knots of tension and the person is then a slave again until the energy has had its feed. The attention has to be swifter than the anger to prevent it from entering the brain. Of course, this means continually practising being conscious in the body when the emotions are quiescent for it to be effective when anger tries to arise. Then, although the emotional residue of any heated exchange can linger as a background vibration, the anger is eventually neutralised. Love is the cure for every negative condition on earth. But a cursory look at the awful mess we human beings have made of the planet, and of ourselves, shows that human love is not up to the job. Pure love can indeed transform the life for good, but only when the individual is willing to be responsible for anger or any other emotional aberration within their own subconscious. The biggest step that can be taken is to surrender the right to be angry. This doesn’t mean not taking an appropriate course of action such as severing ties to a relationship. The thing is to let go of anger as any negative feelings associated with a person or event. Anger can only arise when there’s a demand on life for something that is either impossible to bring about in the present or that the person refuses to surrender as an emotional attachment from the past. As difficult and challenging as it may be, the truth is that there’s never any justification to be angry.